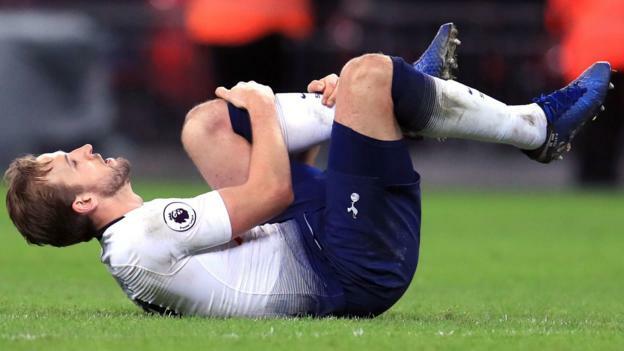 Tottenham are not under “pressure” to sign a new forward this month despite captain Harry Kane being injured, says manager Mauricio Pochettino. England skipper Kane is not due to return to training until March after damaging ankle ligaments. Pochettino acknowledged the 25-year-old’s absence will affect Spurs’ performances. Who will score the goals for Spurs with Kane injured? Spurs, third in the Premier League table and nine points behind leaders Liverpool, are still competing on four fronts. They will take a 1-0 lead to Chelsea in their Carabao Cup semi-final second leg, and then meet Crystal Palace in the FA Cup fourth round before facing Borussia Dortmund in the Champions League last 16. Asked on Friday whether he was under pressure to find a replacement for Kane, Pochettino said: “When he is one of the best strikers in Europe, it is going to affect performances. “Always we’re open to improving our squad, to adding players that can improve us. But I think that’s not going to put pressure on us to sign some players. “We know very well the market now is so difficult, and the circumstance that we have. Of course, like always I tell you, if we identify the player that is going to help us and can add qualities that we don’t have in the squad, we’re more than open to trying [to make] that happen. Next articleIs there hope for peace in Afghanistan?